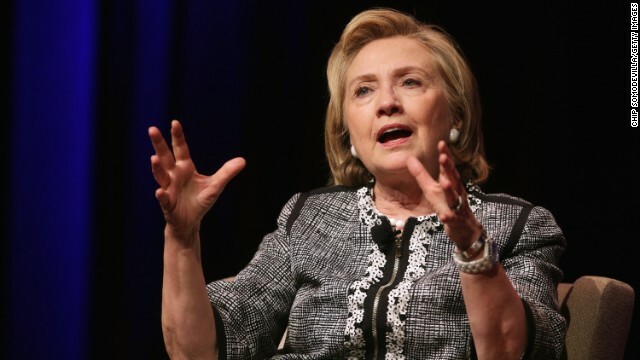 Washington (CNN) – Hillary Clinton first opened the can of worms on her sizable wealth during the first interview of her book tour on June 9. Nearly two months later, Clinton is still being asked about it and tells Fusion that she regrets telling ABC's Diane Sawyer that her family was 'dead broke' when they left the White House in 2001. "Well, I regret it. It was in-artful," she told Fusion's Jorge Ramos in a portion of an interview posted Monday night. "It was accurate but we are so successful and we're so blessed by the success we've had and my husband has worked incredibly hard." Clinton then pivoted from her personal wealth and previous comments to what she hopes to do in the future for people struggling to get out of debt. "What I worry about is not my family. I worry about other families in our country who feel like they're running in place, they're not getting ahead or maybe they are falling backwards," Clinton said. "What I want to do–and this is what Bill has always done since the very beginning of his public life–is to try to create more ladders of opportunity for more Americans so that they can have the same opportunities that Bill and I have had." Clinton's comments about being “dead broke” and in debt in 2001 rang hollow to many given the fact the family had two massive book advances in the works, a sizable government pension, and the prospect of making millions on the speaking circuit in their future. Clinton has called her comments in-artful a number of times, including the day after her first interview. "That may have not been the most artful way of saying that you know Bill and I have gone through a lot of different phases in your lives," Clinton said at an event with Chicago Mayor Rahm Emanuel. Both Bill and Hillary Clinton, however, have accurately stood by the fact that their family was in debt after leaving the White House. According to financial disclosure forms, the Clintons had between $2.28 million to $10.6 million in debt in 2001. Former President Bill Clinton recently told an audience that that amount of debt "would qualify as being dead broke." But the Clintons didn't stay in debt for long. A CNN analysis of the family's financial records in early 2013 showed that Bill Clinton had earned $106 million from paid speeches since leaving the presidency behind. Bloomberg reported earlier this month that Hillary Clinton has earned $12 million speaking and writing since leaving the state department in 2013. Questions about Clinton's wealth have persisted for the last two months. Republicans seized on the talking point in an effort to paint the former secretary of state and possible 2016 presidential hopeful as out of touch with everyday Americans, and reporters have continued to press to see how much money the Clintons have made since leaving public service. Ramos, whose full interview with Clinton will air Tuesday night, also asked Clinton if she knew her net worth. "Within a range," Clinton said. "We have two very nice houses which we are very proud of." When asked if the figure was in the millions, Clinton responded, "Yes, indeed." – CNN's Robert Yoon contributed to this report. Misstep? Like when she landed in Iraq in the middle of the night under heavy opposition gun fire (that NEVER happened)? I do not see why Hillary wants to be in news every now and then. Misstep? Like when she landed in the middle of the night under heavy opposition gun fire (that NEVER happened)?